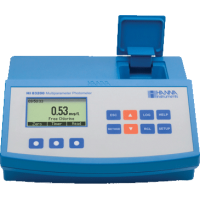 Hanna HI 83200-02 provides a compact, portable laboratory photometer. Specially designed to run quickly and efficiently. Water analysis. 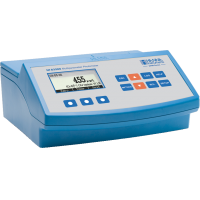 HI 83200-02 can define up to 45 parameters. Determination of quality drinking water, boiler & cooling waters and process waters is not a problem for the HI 83200-02. 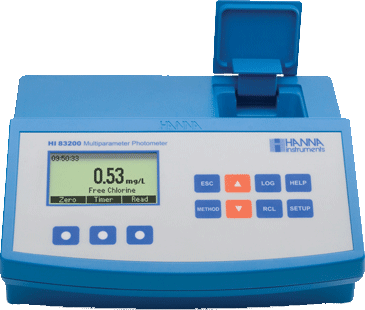 HI 83200 is one of the most versatile photometers on the market. Just one meter measures up to 44 methods critical to analyzing water quality. The optical system of HI 83200 is based on special subminiature tungsten lamps and narrow-band interference filters to guarantee both high performance and reliable results. HI 83200 has a powerful interactive user support that assists the user during the analysis process. A full tutorial is available in the Setup Menu, and the Help Menu provides assistance for every step in the measurement process. This meter can be connected to a PC via a USB cable, where the data can be managed with optional HI 92000 Windows® compatible software. Includes standard more than 45 pre-programmed tests Hanna aluminum , phosphates, iron to zinc. Download data may at any time via the USB connection so connecting to PC.